Aquaculture, once a fledgling industry, now accounts for 50 percent of the fish consumed globally, according to a new report by an international team of researchers. And while the industry is more efficient than ever, it is also putting a significant strain on marine resources by consuming large amounts of feed made from wild fish harvested from the sea, the authors conclude. Their findings are published in the Sept. 7 online edition of the Proceedings of the National Academy of Sciences (PNAS). "Aquaculture is set to reach a landmark in 2009, supplying half of the total fish and shellfish for human consumption," the authors wrote. Between 1995 and 2007, global production of farmed fish nearly tripled in volume, in part because of rising consumer demand for long-chain omega-3 fatty acids. Oily fish, such as salmon, are a major source of these omega-3s, which are effective in reducing the risk of cardiovascular disease, according to the National Institutes of Health. "The huge expansion is being driven by demand," said lead author Rosamond L. Naylor, a professor of environmental Earth system science at Stanford University and director of the Stanford Program on Food Security and the Environment. "As long as we are a health-conscious population trying to get our most healthy oils from fish, we are going to be demanding more of aquaculture and putting a lot of pressure on marine fisheries to meet that need." To maximize growth and enhance flavor, aquaculture farms use large quantities of fishmeal and fish oil made from less valuable wild-caught species, including anchoveta and sardine. "With the production of farmed fish eclipsing that of wild fish, another major transition is also underway: Aquaculture's share of global fishmeal and fish oil consumption more than doubled over the past decade to 68 percent and 88 percent, respectively," the authors wrote. In 2006, aquaculture production was 51.7 million metric tons, and about 20 million metric tons of wild fish were harvested for the production of fishmeal. "It can take up to 5 pounds of wild fish to produce 1 pound of salmon, and we eat a lot of salmon," said Naylor, the William Wrigley Senior Fellow at Stanford's Woods Institute for the Environment and Freeman Spogli Institute for International Studies. One way to make salmon farming more environmentally sustainable is to simply lower the amount of fish oil in the salmon's diet. According to the authors, a mere 4 percent reduction in fish oil would significantly reduce the amount of wild fish needed to produce 1 pound of salmon from 5 pounds to just 3.9 pounds. In contrast, reducing fishmeal use by 4 percent would have very little environmental impact, they said. "Reducing the amount of fish oil in the salmon's diet definitely gets you a lot more bang for the buck than reducing the amount of fishmeal," Naylor said. "Our thirst for long-chain omega-3 oils will continue to put a lot of strain on marine ecosystems, unless we develop commercially viable alternatives soon." Naylor and her co-authors pointed to several fish-feed substitutes currently being investigated, including protein made from grain and livestock byproducts, and long-chain omega-3 oils extracted from single-cell microorganisms and genetically modified land plants. "With appropriate economic and regulatory incentives, the transition toward alternative feedstuffs could accelerate, paving the way for a consensus that aquaculture is aiding the ocean, not depleting it," the authors wrote. Fishmeal and fish oil are important staples at farms that produce carnivorous fish, including salmon, trout and tuna. But vegetarian species, such as Chinese carp and tilapia, can be raised on feed made from plants instead of wild-caught fish. That's one reason why farm-raised vegetarian fish have long been considered environmentally friendly. In the early 1990s, vegetarian fish farms began adding small amounts of fishmeal in their feed to increase yields. However, between 1995 and 2007, farmers actually reduced the share of fishmeal in carp diets by 50 percent and in tilapia diets by nearly two-thirds, according to the PNAS report. Nevertheless, in 2007, tilapia and carp farms together consumed more than 12 million metric tons of fishmeal—more than 1.5 times the amount used by shrimp and salmon farms combined. 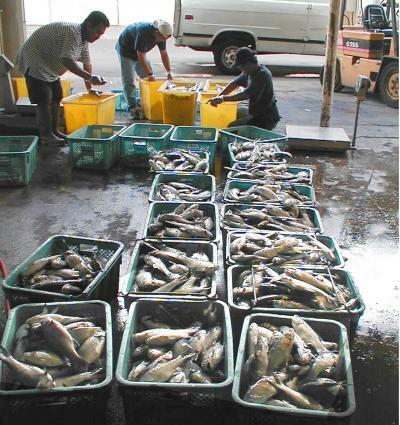 "Our assumption about farmed tilapia and carp being environmentally friendly turns out to be wrong in aggregate, because the sheer volume is driving up the demand," Naylor said. "Even the small amounts of fishmeal used to raise vegetarian fish add up to a lot on a global scale." Removing fishmeal from the diet of tilapia and carp would have a very positive impact on the marine environment, she added. On the policy front, Naylor pointed to California's Sustainable Oceans Act and the proposed National Offshore Aquaculture Act, which call for reductions in the use of fishmeal and fish oil in feeds. She also applauded plans by the National Oceanographic and Atmospheric Administration to develop a comprehensive national policy that addresses fisheries management issues posed by aquaculture. "No matter how much is done from the demand side, it is essential that there be regulation on the supply side as well," Naylor said. "You won't prevent the collapse of anchoveta, sardine and other wild fisheries unless those fisheries are carefully regulated."